Photographed in Phoenix, Arizona, October 2003. 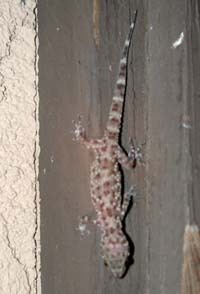 This nocturnal lizard is native to the Mediterranean region, but is now common in warm climate areas of the southern United States. They are most common in urban areas. It has warty skin with spots and bands. These lizards have special padded feet that allow them to move on vertical or even inverted surfaces. They can also make faint clicks and squeaks as part of their mating and alarm communications. Copyright Michael J. Plagens, page created 7 June 2003.